Free guided tours begin at the North Entrance on 2nd Floor. Tours last 30-55 minutes featuring the Vestibule, Foyer and Rotunda and include the Legislative Chamber and Supreme Court when they are not in session. Please phone (402)471-0448 or e-mail the guides for more information about tours and tour times. 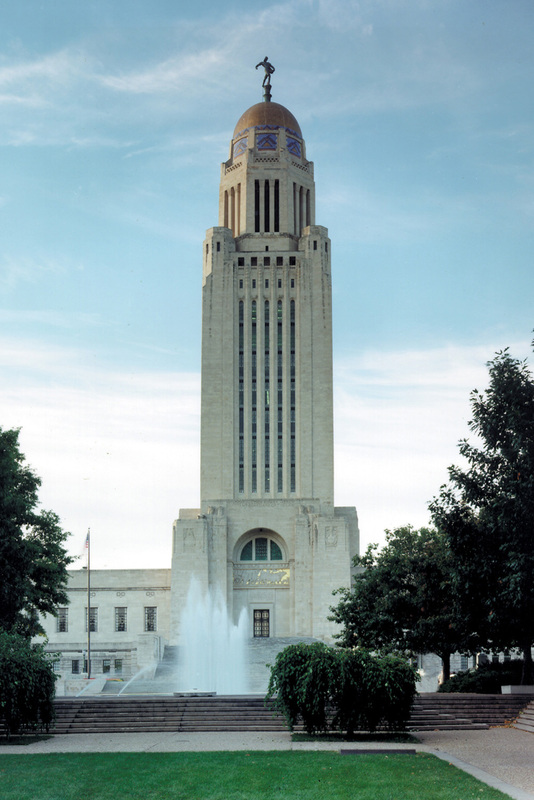 The Nebraska State Capitol main entrance is at the intersection of 15th and K Streets (1445 K St., Lincoln, NE 68509) adjacent to downtown Lincoln. When approaching Lincoln from Interstate 80 westbound take the Downtown 9th Street exit and follow I-180 south into downtown Lincoln continue south on 9th Street to K Street, turn left (east) and proceed 6 blocks. When approaching from Interstate 80 eastbound take the #403 exit U.S. 77 south, follow the expressway to Rosa Parks Way, turn left (east) and follow the parkway to the Capitol. When approaching from the southeast on Nebraska Highway 2 proceed northwest until the 13th/14th Street intersection, turn right and travel approximately 4 miles north to J Street, turn right two blocks to the Capitol. When approaching from the south on US Highway 77 proceed north to Rosa Parks Way, turn right (east) and remain on the parkway until it reaches the Capitol at 15th. Parking may be found on the streets surrounding the Capitol. Longer term parking may be found in the residential areas south of the Capitol. The nearest public parking garage is located at 12th Street (one way north) and L Street (one way west). Accessible parking is available on K Street adjacent to the Capitol’s north entrance. Bicycle racks are provided in the northwest corners of the parking lots south and east of the Capitol; bicycles are not allowed to park at the north entrance. Bicycles are not allowed inside the Capitol. There are ground level entrances on each side of the Capitol. Ground level entrances are open all year. The North Grand Staircase Entrance is open as the seasons allow. The accessible entrance is located under the North Grand Staircase. Sidewalks flanking driveway lead to accessible entrance. Inside the ground level North Door and to the right (west) in Room #1009 is an accessible elevator for visits to the second floor offices of Government, the Governor’s Office, the Legislative Chambers, and the Supreme and Appeals Courts, and tours. The central tower elevators offer limited accessibility with doorways 28” wide. A wheelchair, which fits in the tower elevators, is available at the Security office, phone (402)471-2400. Security is located near the elevator vestibule in the northeast corner of the 1st ground floor Rotunda and near the central information desk, phone (402)471-0400 . The architect who designed the Nebraska State Capitol was Bertram Goodhue. The thematic program of the Capitol was developed by Dr. Hartley Burr Alexander. Sculptor for the Capitol was Lee Lawrie, and Hildreth Meiere designed all the floor and ceiling mosaics. The building was constructed over a ten year period in four building phases. Construction began in 1922 and was completed in 1932. Total cost of the building was just under $10 million.